So, I did a thing. 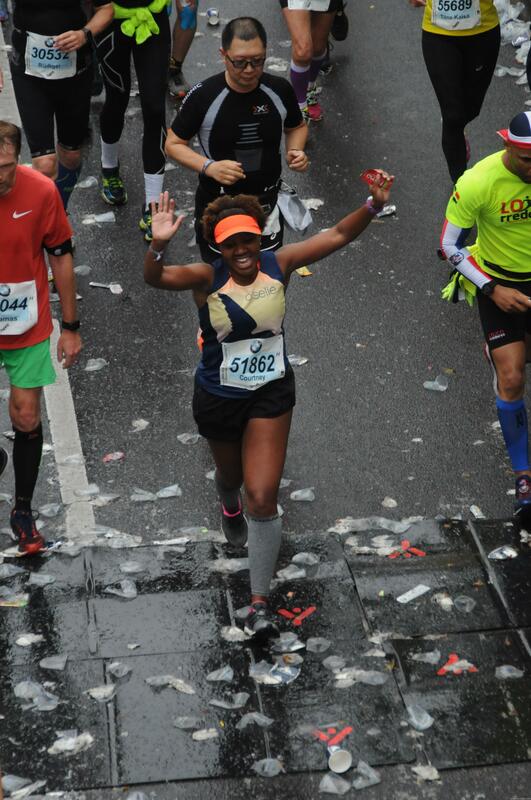 I ran the Berlin Marathon. This was my first international race and I set a big goal of running a sub-4 marathon. This was my first sub-4 attempt and I did not run sub-4, but did PR by a good bit. I ran 4:14:10 and like I said in my Instagram post, I fought for it. 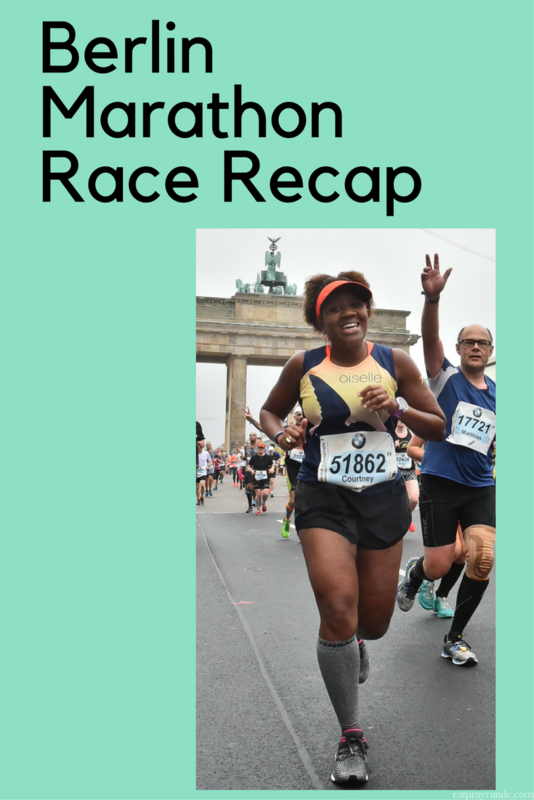 Here’s my Berlin Marathon race recap. The weather was looking good leading into the race, but to be honest, I didn’t worry much about the weather anyway. In my mind, the weather will be what it will be and I can’t control it so no sense worrying about it. I did think it might rain (which it did). The one thing I kept saying was “well I know that Berlin does not have humidity like we have here in DC, so I’m not worried about humidity.” A reasonable enough statement. But unfortunately, with it raining the night before the race and the morning of and then some during, the humidity was at 99% at the start of the race. 99% and 57 degrees F to be exact. Not so great. BUT – I have PRed before in poor weather (hello, Shamrock and my first sub-2) and thought that I could do it again. The race consisted of three waves and each wave contained a MASSIVE amount of people. I was in the last wave (for people with marathon PRs of 4:15 or higher, plus all first time marathoners) and we did not start until 10am. But…before getting into the nitty gritty, let me say this. I was really lucky because on this trip, I traveled with a number of my Oiselle teammates and that added SO MUCH to the trip overall. I will talk more about my adventures in a future post(s) but truly being with teammates abroad was an AMAZING experience. Back to race weekend. After a fun shakeout run with some of the other Oiselle gals running the race the day before, I was ready. On race morning, Sheila, Mike (Sheila’s awesome husband) and I headed over to the start which was in between the Brandenburg Gate and the Victory column. We ran into Carolina, had a final bathroom break and then headed to our respective start corrals. As I mentioned, my wave took off at 10am (on the dot – German efficiency! ), so I had about an hour in my corral. When it was finally our time, I found myself getting uncharacteristically emotional. I mean, I am definitely an emotional person and cry at pretty much anything involving dogs or dads (total daddy’s girl here), so crying is my MO. But I generally don’t cry in public and I have never teared up at a starting line before. 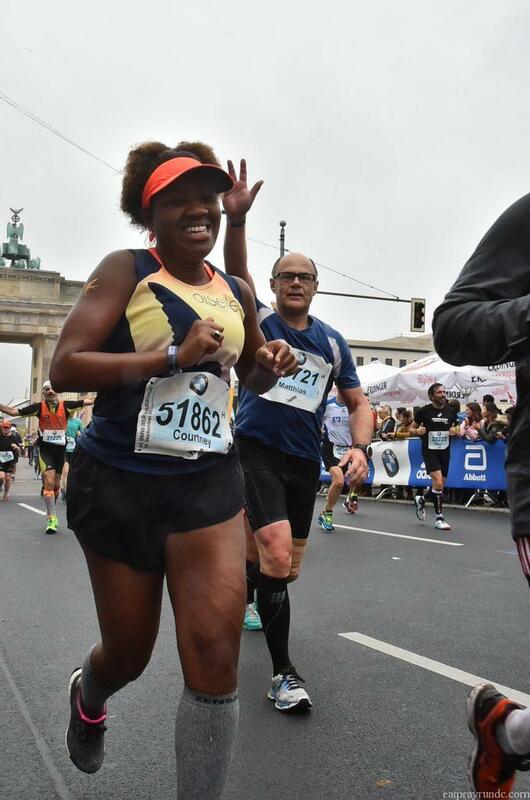 I think I was just so overwhelmed with the weight of where I was – Berlin, Germany – and what I was doing – running my 8th marathon. I felt incredibly fortunate and just so grateful to be doing what I was doing. So, with tears in my eyes, the race started. The course was incredibly crowded. From start to finish, it was packed and I constantly had to maneuver around people. I felt like a football player at times because I ran a lot with my arm out in front of me to stop people from running right into my path. That said, I got into a groove pretty quickly and just kept trucking. I did feel the humidity pretty early on. It was just gross and the ground was slick because of the rain. I ran with my handheld because I had heard that the first couple of water stops were insane. Well, that was not true. ALL the water stops were insane until about the 35k mark. They were just a hot mess. I was happy to avoid them for awhile. I continued to settle in and just focused on my form and trying to run controlled. My clothes were completely soaked through due to the humidity and I was very thirsty. I drank often and took a Huma gel at every 10k mark. I felt like I was working pretty hard to hit the splits I was hitting – which makes sense given the weather. I wish I could tell you what I was running past at this point, but honestly, the race was such a blur. I did not spend very much time looking around because I felt like I had to stay super vigilant while racing. I’ll talk about this a bit more later, but I am a bit disappointed that I did not enjoy my surroundings more. I loved the crowds and the bands but as far as getting a running tour of Berlin, that did not happen. I just couldn’t take my eyes off the road – I was very worried about falling or being tripped or ran into by another runner. I hit the half in 2:00 flat and knew I was a little behind my time, but hoped I could just hold on. Somewhere in these miles, I ditched my handheld, which was a part of the plan. I then started walking through each water stop – I knew that hydration was incredibly important and to be honest, the quick breaks were welcomed. The race was starting to get very hard, which you can see in my splits. I tried very hard to adjust in my head – but figuring out the kilometer to mile conversion and trying to do math just was not working, lol. The picture below was right around the 30k mark. I know because I remember being excited for my strawberry Huma gel at 30k, haha. Also, somewhere around this time, I ran into Travis and Marilyn. Marilyn is one of my Oiselle teammates and she and her husband Travis were running together. It was FANTASTIC to run into them during the race, especially because it was late in the race and I was getting tired. It pumped me up to see them and Marilyn even snapped a couple pics, one of which you can see on her great race recap here. Well, like I said, it got really hard. I continued to walk the water stops and obviously I walked more than the water stops. I know that the humidity and the crowding on the course took its toll, but honestly, I was in a fight out there. I was hurting but marathons hurt, so I knew that would be the case. It just got so dang hard to run fast. That really is all it was. I was trying my hardest and I was just done – my hardest was not enough. Once I got closer to the finish, I started to get angry. I knew we were to run through the Brandenburg Gate about 400m before the finish line…But I could NOT see the Gate. It took all my will to not scream at spectators “where the F is the Gate?!?!?!? !” – finally, we turned and the Gate was in sight. Now I also knew that the Gate was not the finish line. But man, the 400m or so between the Gate and the finish felt SO SO long. I tried to smile for the cameras but I think you can see how I truly felt! Finish time: 4:14:10. This was a 15 minute PR for me, which is awesome. I felt absolutely horrible after I finished. I was so lucky because I ran into my friend and teammate Cecille right after I crossed. Cecille helped me get my timing chip off and we started walking towards the finish area. Because I hurt so dang bad (running marathons is hard, y’all), I had to stop a couple of times. One of those times we spotted Marilyn and Travis and called them over to join us. We all hobbled over to get our sweet finisher ponchos and just laid / sat down and ate a bit before leaving. Being with friends post race was amazing – and potentially life saving. I am pretty sure that without them being there I would have just laid on the ground in the finish area forever. I am only exaggerating a tiny bit. This race was a lot of things. Large, a great experience, crowded, tough, amazing, international and so much more. I think that in retrospect, I would NOT have chosen Berlin to be my goal race because as I briefly mentioned above, I barely saw the city as I was running. I think that for other international races, I will choose to run them for fun and for the experience rather than attach a big goal to them. I feel good about my race. Even though it was not what I expected, I worked very hard for that 4:14 and the fact that I ran 21 miles under a 10mm pace (and most of those miles under 9:30) is nothing short of amazing to me. I have worked very hard to improve as a runner and while I did not reach my A goal, I left every single thing I had in me on that course in Berlin. For that, I am proud. One other quick note about the race. I have run a lot of races and this was my 8th marathon. This race felt overwhelmingly male. I felt like I was surrounded by men and saw relatively few women running. It was a strange feeling and I like it contributed some to constantly feeling like people were cutting in front of me, etc. I would be really interested to see the gender breakdown of the race. I could not find anything during a quick search online but it felt like the race was 65 to 75% male. Definitely different than what I am used to! As far as what is next for me, well that is still in flux. I am currently signed up for the Richmond marathon in about 5 weeks. I have not decided yet if I will race the marathon or drop down to the half. I probably will not decide until the week of the race. Until then, I will enjoy some more causal running with the Army Ten Miler thrown in the mix for fun. Have you run an international race? Did you race it or just run for fun? Oh Courtney, I had some similar experiences at Berlin. The overwhelmingly male runner comment actually surprised me. When I ran Tokyo in February, that race is something like 80% male so be prepared when you decide to run that major. The friend I ran with did not feel like the pavement was slick at all, but on the other hand, I struggled with worry over slipping so much and my shoes only had 40 miles on them. It was gross outside but thankfully I missed the overhead board flashing the % humidity before the race. I was sweating after mile 1 and knew it was a day to just push on through. You really ran a great race and have a lot to be proud of. A huge PR in tough conditions is not easy. I heard of so many runners who were disappointed in their results. Weather can really throw a curve ball on race day and I think you did amazing with the later start, crowded course and humidity Congrats on a job well done. I am TOTALLY that person who gets teary at the start of most races. Especially in the US when the national anthem is sung. I just feel so blessed/excited/overwhelmed for everything around me so I totally feel you there. Thanks for the awesome recap and congrats on your race!!! Congratulations, Courtney!! You are amazing! Racing in the humidity is SO hard – it kills me every time. You fought hard and you still got a huge PR! My first international race was RNR Montreal a couple weekends ago, which was hampered by the high heat and humidity, so I was glad that I didn’t have it as my goal race. It was pretty crowded too and I didn’t get to enjoy the sights as much as I liked either. But it’s such a cool experience to run in another country! Thanks Janelle – it was quite an experience. I hope to have the chance to run many more international races in the future! girl. thank you. it was SO hard but i’m happy that i never gave up – even if i did slow down. excited for our thursday run – of course i woke up at 6am today and couldn’t go back to sleep. total fail! Congratulations Courtney! I can related to the overwhelming feeling of being at a marathon! I have not done an international race yet but I have had those same feelings. It’s such an emotional event! I’m glad you were able to share this experience with friends and that you had somebody there with you at the finish since you weren’t feeling so well!. Congrats again on such a major accomplishment and PR! Thank you – it was an incredible experience! And yes, very emotional! Marathons are hard! Way to fight as long as you did and congrats on the PR! i’ve been checking back excited to read your recap. first, congrats on completing your 8th marathon. i loved reading your weekly training recaps and am totally inspired as i train for my first one (NYC). second, even though you didn’t meet your A goal, a 15 minute PR is a HUGE deal. i’m very excited for you. happy recovery! Congrats on the race! You nailed a lot of my experience, too! The humidity certainly made things challenging, and I felt similarly throughout the course while being soaked and exhausted. I also didnt see much of the city, for the same reason as I was staring at the ground for most of it. And those last 400m through the gate felt like never-ending!!! And per the gender ratio: wasn’t that crazy! I had read somewhere that it would be something like 70% men to 30% women. Those numbers seemed right when I was walking around the expo and waiting in my corral. Yeah – I was thinking 70% as well. What a day, right???? Are you gonna write a recap? I’d love to read it if so! Reading this was very emotional for me Courtney. I trained for a 3:50 marathon at Erie in 2015 and went through something very similar. Your final splits brought tears to my eyes because I know how hard those miles can be. I fell short of my goal and missed sub four as well. It was still a PR for me but I’ve never been so devastated to PR. Be proud of your PR. You earned it with every step. It takes guts to keep going and you did. Thank you – it was an incredible experience! Congrats on your great PR!! And awesome that there were so many teammates there. I think international races tend to be more male (at least my experience with races in England). Yes, that is what I have heard. So so interesting!!! I can totally relate to what happened to you out there. Done that! What a great accomplishment to run this race, congrats!! Maybe not the sub 4, but what a great experience and PR you did get! Interesting about the percentage of males that were running. Haha, the marathon is such a monster. It was a great experience and I will cherish those memories! I love your recap! What a race! You should be proud, you kept fighting on such a hard day. I am so glad I got to be a tiny small part of it, and I am also glad you are still not sitting on the lawn in front of the Reichstag! Wishing you a speedy recovery – muscles and jet lag – and I can’t wait to hear what you decide for Richmond! Congratulations on your marathon, Courtney! 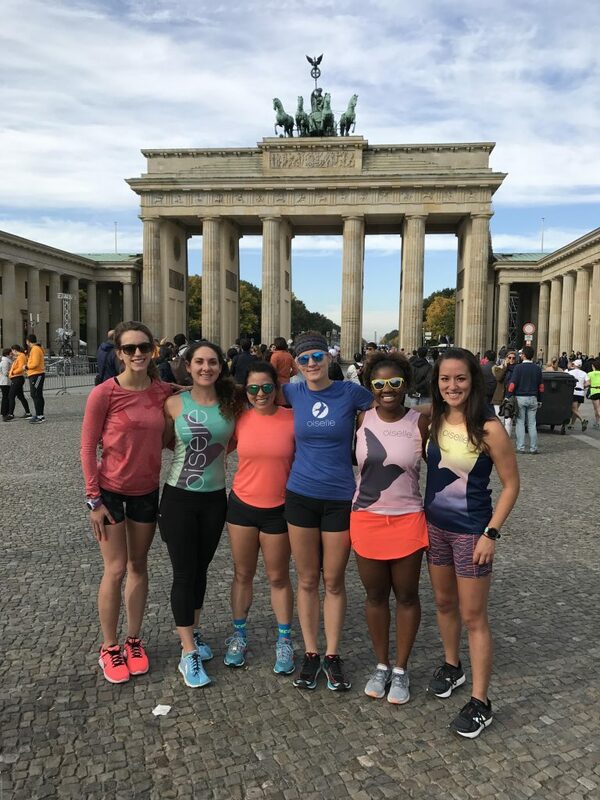 Even if the time doesn’t necessarily reflect your training and hard work, you finished injury free, smiling, and it looks like you had a lot of fun on your trip to Germany. You have a LOT to be proud of and the workouts you put in will pay off for you in the future even if the marathon day was a rough day. 26.2 miles is a long time for things to go right. I hope you have a good recovery from the race as well! Thank you – I am proud of the PR but more proud of the work put in. I know sub-4 will come — now I’m just 15 minutes away! Congratulations!! Could not be more proud of you! I know you’re a fighter and you’ve proved it yet again. Interesting about the gender breakdown — you actually do look like you’re surrounded by guys in all the race pictures,. Yes the gender thing was surprising because it was so noticeable to me! I hear that is common with races in other countries, though. I got all the feels reading this. Huge, huge congrats to you Courtney–you so earned that feeling of pride! The thing that struck me most is that you felt like you were working hard early in the race. It says a lot about your confidence that you were able to keep on pushing and not just given up right then if those early miles were tough. And look what that positive outlook got you–a PR in pretty much the worst weather conditions possible, and, more important I think, pride in how you did and what you accomplished. You’re so right that running 21 miles mostly under a 9:30 pace in that humidity is just a huge accomplishment on its own. Congrats again!!! PS: What’s up with that dude getting in your shots?! Thank you Jennifer! It was a reminder that the marathon demands so much of us. It was a tough day for many but I will always treasure that experience. And yeah, I laughed when I saw that guy in my pics, lol! Congratulations!!! Marathons ARE hard. I’ve done the Stramilano 10K in Milan twice and both times it felt overwhelmingly male. But races that I’ve done in London felt pretty evenly distributed. Thanks for the congrats. Yes – marathons are hard lol 🙂 Interesting about the gender stuff, eh? Congratulations Courtney on an incredible PR! You may not have met your A goal, but I am sure that it will be in your near future – way to go racing in not ideal racing conditions! Way to go, and a nice PR too 🙂 I DVR’d the race to watch when I woke up, so I saw the rain, but didn’t know about the humidity. I don’t like to run on wet pavement because my feet slip, and humidity takes a lot of out me. You did a great job. Good luck with Richmond and the Army 10-miler. Thank you – not great weather but what can you do?? Hmm, your observation about the race being so male-dominated is super interesting! I hope you’ll share with us anything you find out, in terms of a participant breakdown; that would be fascinating! Also, I wonder why this is? Very intriguing! On to the rest…those streets look treacherous with all of the slick wetness and trash from people’s cups, etc. Wow. I’m so glad that you were able to stay safe out there and, in the midst of it all, manage to run so strongly and kill your old PR. BIG CONGRATS, my friend! I’m super pumped about Richmond; excited to see you so soon. I can NOT wait to see you in Richmond!!!!!!!!!!!! CONGRATS!! I am so proud of you and what you accomplished in those elements. it sounds so difficult and while you didnt make your A goal, you have a lot to be proud of. it sounds like you fought hard for that finish and PR. Rest up, re-evaluate your next race, and I cant wait to see what you do next. Great job Courtney and congrats again on your PR! This was a great race recap and I can see how you really put up a great fight for all of your miles. You should be incredibly proud of yourself! I was reading Marcia’s race recap and she also mentioned running with her elbows out to avoid runners cutting in front of her – I’m sure that had to be very frustrating!! Thank you Kim. It was a hard day but I appreciate the support. And yeah it was kind of hard out there! Courtney, congrats!! You have so much to be proud of, and a PR in those conditions is amazing. Sometimes the training isn’t about running a time we have in our mind, but giving us the ability to run the best race we can on any particular day, which you definitely did!!! Excited to keep following your journey. Congrats again! Congratulations on your new PR! It’s interesting that the race was mostly male. I’ve run a few female-only races and they are ALWAYS more polite with less cutting and jostling. If you’re able to recover quickly and get back into the marathon mindset Richmond could be great. Cooler weather, familiar course, and teammates cheering. Whatever you choose, I know it’ll be fun! Congrats again! Strong race. Great race girl! Awesome to PR at such a tough race and less than favorable conditions. Way to power thru when you weren’t feeling your greatest. I didn’t think any place could be as humid as the DMV. I’m headed back to Chicago this weekend and it looks to be as warm if not warmer than last year. Hope you had a good day in Chicago. I know it was very very warm – tough day! Great job in Berlin! You should be incredibly proud that you pushed through the pain to nail that PR. I really do think humidity has more to do than temperature, at least for me when I run. You did great! I was thinking of you and the people doing Chicago as I slogged through ATM today. Humidity is rough! Today was tough. The humidity was the same as in Berlin but in Berlin it was about 15 degrees cooler which helped it not be totally awful until the end. LOL. Courtney, I was also there. Never in a million years I would think I would be zigzagging all the way till the end on a marathon, that totally costed me the sub 4, my watch says 26.90! It was def crowded, but it was a great race. Like yourself, I did not look around at all. I also wrote a recap on my blog, if you are interested. The crowding was crazy. I think it would be great if they released people in more waves, like Chicago. Congrats on your race! CONGRATS ON A FANTASTIC MARATHON UNDER ROUGH CONDITIONS. I’VE NOT RUN AN INTERNATIONAL MARATHON, BUT THINK YOU’RE SMART FOR MAKING YOUR NEXT ONE A “FOR FUN” RACE. I HAVE ENOUGH TROUBLE DOING BASIC MATH IN MY HEAD DURING A MARATHON WHEN I’M JUST WORKING WITH MILES. I CAN’T IMAGINE TRYING TO CONVERT KILOMETERS INTO MILES! THANKS FOR THE RECAPS! 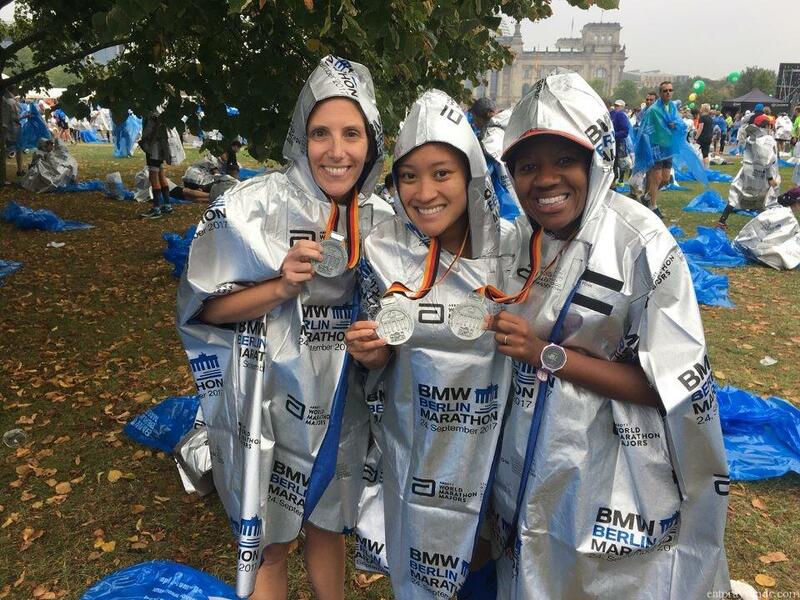 IT WAS FUN READING ABOUT YOUR FIRST INTERNATIONAL MARATHON EXPERIENCE. What a dweeb to type my comment in all caps… I had no idea I was doing that. Sorry! Totally tardy to the party but wanted to say congrats on your PR!! I just found your blog and am looking forward to binge reading it for the rest of the night. I’ll be at Richmond in a few weeks so I hope I run into you (not literally, that would be painful) sometime that weekend! I’ve been following your blog and putting some major thought into running an international race! Kudos on your PR. Questions about the humidity: Was the humidity typical for the Berlin Marathon, or just b/c of the weather that day? Also, do you typically get a lot of humidity in DC? I imagine it would be incredibly hard to run in the humidity if not. We get a ridiculous amount of humidity in Louisiana! Hopefully if its typically humid for the Berlin Marathon, my running here would prepare me for it!